The last time I was in Harbor Square in CCP was exactly a year ago. We had a fun yacht party. Last Friday was no different - we had good company, good food and good drinks - but the party happened in Dencio's newly renovated store in Harbor Square. We came perfectly before the sun went down and we took the chance to take some pictures. It is as if, it was the first time I was seeing this view in Manila.. so this happened.. I am too lazy to edit the picture to show you the colors of the bay side (it was just a teaser, because you have to go there and be there!). Anyway, facing this view is the newly renovated Dencio's Bar and Grill - with its provincial-resort type restaurant. From the typical barrio foodie hub to urban metropolis bar, Dencio's is still one of the favorite hang-out places after 23 years. Dencio's is now part of the Max's Group family of brands and Jim Fuentebella, Branding Director of Max's Group Inc says "Dencio's remains a beloved restaurant among Pinoys. To stay top of mind, we refurbished the store's look to better reflect the core values that built the brand. And we couldn't do this without the help of its original founder". Dennis Nakpil, who founded Dencio's in 1991, shares they want to stay local with the brand's local and original flavor. The new Dencio's in Harbor Square, CCP keeps the native flavor both in its ambiance and food offering. I love how the store provides a more family-oriented feel. The play on wood and glass panels are just perfect for the location for guests to appreciate the authentic feel of traditional Filipino dining. There are function rooms which can be booked for gatherings and meetings. An interesting addition to the lay-out is the sports area and the bar. 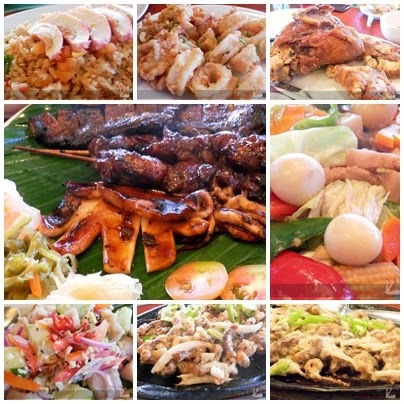 We had a feast enjoying Dencio's favorite dishes! We felt like a big family on a reunion. The mood was light, the view of the sunset outside was perfect and the food is always good at Dencio's! We especially love Crispy Pata! Earth & I had a fun time with our margaritas! We would have wanted to stay longer but we needed to rush out to attend another event. We toasted and celebrated Myke's birthday! Before we battled the traffic that mad Friday night, we tried our hands on Darts. My last throw was perfect! If you hit 3, you get a bucket! The new Dencio's store truly caters to different diners - families, sports enthusiasts, friends and lovers. The new store concept would soon be seen in the brand's nine other branches in the Philippines. Now that Dencio's is under MGI (Max's Group Inc), Max will focus on the restaurant's execution and operations while Dennis (Dencio's) will take charge of creative side of things. I cannot wait to go back.. and enjoy this view again..